Now on to Chapter 2 - It’s fitting that Toy Story opens with the same image as the final frame of Toy Story 3: a picture-perfect blue sky dotted with carefully placed, fluffy clouds. 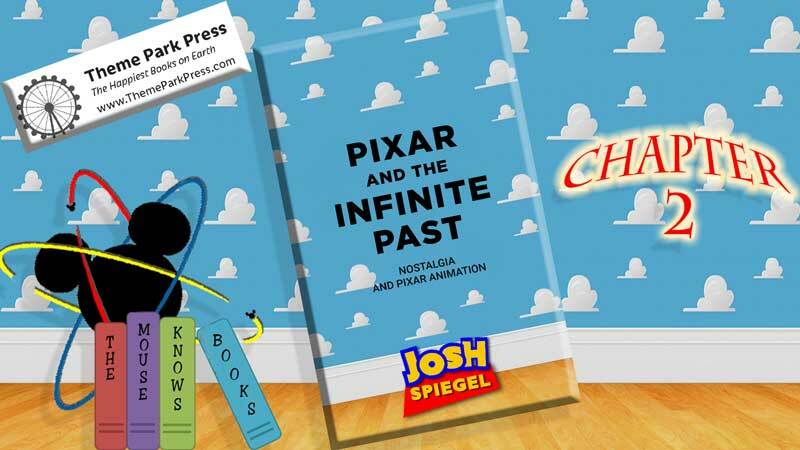 Join Cody, Justin, and Joe as we talk with the Josh Spiegel the author of Pixar and the Infinite Past Nostalgia and Pixar Animation. So settle in and enjoy. Film critic Josh Spiegel analyzes in depth the poignant themes of loss and nostalgia that run beneath the exuberant playfulness of the Toy Story and Cars films. He concludes with a chapter on Disney animation in the 2010s. With photos. Pixar tickled a yearning in adults who gave up their own Woodys and Buzzes but still cling to the idealized wood and plastic and stuffing of their lost-forever youth. As their own children face forward to the future with Buzz Lightyear's "To infinity...and beyond!" they hear just an echo from their past. Spiegel adroitly positions the Pixar films as not just animated fodder for the kids but as surprisingly sophisticated—and introspective—fare for the grown-ups. Josh Spiegel is a freelance writer and critic whose work has appeared in publications such as Slashfilm, The Hollywood Reporter, and The Verge. He also cohosts the Disney movie podcast Mousterpiece Cinema with Scott Renshaw. Josh was previously the editor-in-chief of Movie Mezzanine, as well as the chief film critic and film editor of Sound on Sight. He lives in Arizona with his wife, son, and far too many cats. Just keep reading, just keep reading!